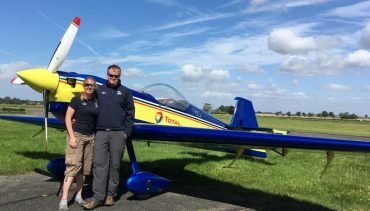 Husband and wife aerobatic pairing Mike and Emily Collett from Denham have been selected to represent Team GB at the European Advanced Aerobatic Championship in the Czech Republic in August. Their Cap 232 will fly with the logo of Air Total, Ultimate Aerobatics’ new partner. The Air Total partnership will support Emily and Mike leading up to the World Championship in 2018. Ultimate Aerobatics will promote Air Total’s products and services during the year to help build awareness and advocacy for Air Total in the aviation community. The European Advanced Aerobatic Championship starts on the 5th August in Chotebor, Czech Republic and runs through to the 13th August with 60 of the top European aerobatic pilots competing for the title. Emily was the British Advanced Aerobatics Champion in 2016 with Mike placed second, following his national title at Intermediate level in 2015.